Of all surviving works of 18th-Century opulence this is one of the most difficult to even imagine in its former glory. On January 11, 1747, the Prime Minister of Saxony and director of the Meissen porcelain factory hosted a grand dinner in his Dresden Palace when the dessert course arrived with an incredible centrepiece. 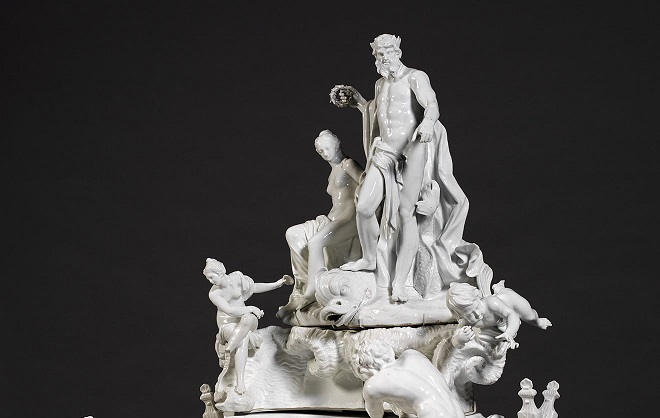 Count von Brühl had commissioned a working porcelain model of The Triumph of Amphitrite based on a stone fountain by Lorenzo Mattielli which still stands in Brühl’s garden in Dresden Friedrichstadt. The dinner was held to celebrate the royal marriage between the Dauphin, the crown-prince of France, and Princess Maria Josepha of Saxony. The sheer spectacle of this fountain must have been a joy to behold – the scent of rose-water as it shimmered across the shells and the immense craftsmanship in the porcelain with only the guests at table reminding viewers of the small scale like a cultivated Bonsai tree. The engineering of the piece inspires all sorts of questions that make it difficult to picture without a cumbersome reservoir suspended above it and further piping to take away the falling water. 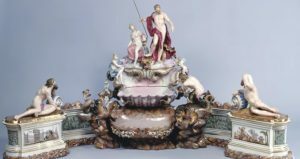 Count Marcolini took over many of Brühl’s official functions after his death including that of director of the Meissen porcelain factory and acquired the incredible table fountain. He restored it using the original moulds and installed it in the orangery of his summer palace with goldfish living in its waters. In 1870 the surviving fragments passed into the possession of the Victoria and Albert Museum where only the figurines were intact enough to display. The mythical backstory would have been entirely absent – Neptune arrives on a shell-chariot with his bride Amphitrite and flanked by two river gods representing the Nile and Tiber and is thought to be presenting a laurel wreath. The piece also features sea-horse creatures called hippocampi. In 2013 the V&A collaborated with the Royal College of Art to restore the fountain using 3D printing technology. Models were made from scans and used to create moulds so that new parts were created in porcelain rather than traditional conservation materials. It is now on display in the new Europe 1600-1815 gallery, just feet away from the silk court coat Christine Yoo Millar recreated with digitised embroidery. Just as the work depicts images of Classical mythology, so too has it followed its own metamorphic story. Once it was a stone fountain in the garden of a great palace which was replicated in minitaure in porcelain and taken to the most unlikely yet decadent setting of a royal feast. From there it became a luxurious furnishing and goldfish bowl and yet it came to the V&A in what sounds little more than a box of broken parts. And yet it was pioneering methods of conservation that allowed art historians to piece together this legendary work that now stands silent in a modest basement room of the V&A.